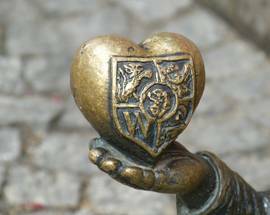 One of Wrocław’s most popular, memorable and iconic attractions is not a cathedral, not a castle or monument, but a legion of little people: Gnomes, or ‘krasnale’ (in local parlance), to be precise. In Wrocław’s city centre these merry munchkins are simply ubiquitous - dotting doorways, alleyways and street corners; constantly underfoot but only seen by the observant. You may well overlook the first few that cross your path, but inevitably – and often literally - you will stumble upon these popular local residents. Keep your eyes peeled and you’re bound to notice the little fellas engaged in a variety of activities about town – from guarding public space to passed-out drunk. Beloved by locals and tourists alike, and the object of more photos than the towering Cathedral, these prolific pranksters have become the unlikely symbol of one of PL’s most picturesque cities. For all the trouble it gave the authorities however, the Orange Alternative was never as interested in political ideology as buffoonery. Detained in a Łódź police station for graffiti, Major Fydrych was happy to explain the gnomes to state authorities in academic terms: “The thesis is the anti-regime slogan. The anti-thesis is the spot and the synthesis is the gnome.” Spoken like a true art history student. As the Orange Alternative graduated to bigger happenings, gnomes began to appear in demonstrations as well. International Children’s Day on June 1, 1988, was celebrated in Wrocław by dozens of locals dressed as gnomes and smurfs, complete with orange hats and handkerchiefs, while an anti-Chernobyl protest saw Major Fydrych handing out iconic peaked orange gnome hats to passing pedestrians. 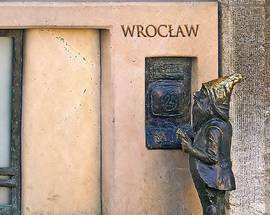 After the fall of communism in Poland, the gnomes remained a symbol of Wrocław, repurposed by the new regime to be a tribute to the Orange Movement and playful city ambassadors. The first gnome in its modern statuette form was Papa Krasnal who was placed in 2001 on the corner of ul. Świdnicka and ul. Kazimierza Wielkiego, near the subway where Orange Alternative demonstrations often took place. Commissioned by Agora (the publisher of newspaper Gazeta Wyborcza) to celebrate the history of the Orange Alternative, Papa Krasnal remains the largest of his progeny. 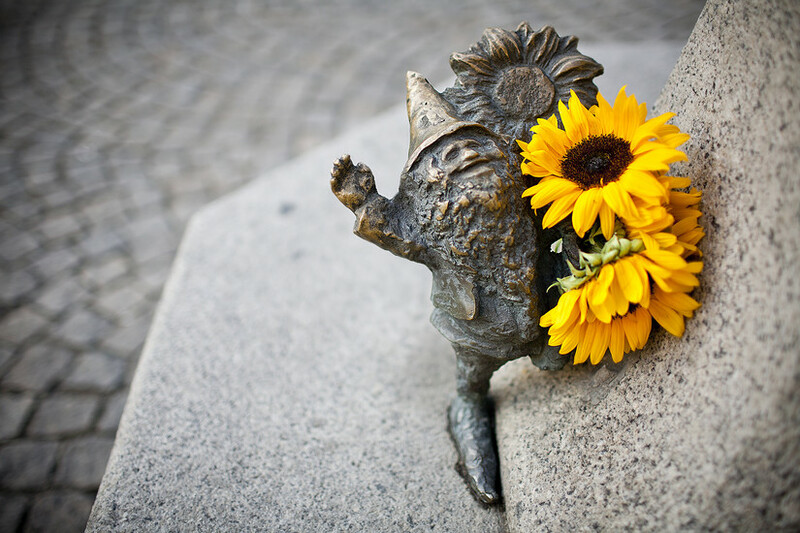 Things really took off in 2005, however, when local artist Tomasz Moczek - a graduate of the Wrocław Academy of Fine Arts – was commissioned by Wrocław City Council to create five more gnomes. The little devils proved so popular that envious local businesses quickly got in on the game by contracting other local artists to produce more, and in almost no time at all gnomes had proliferated around Wrocław to the point that they now constitute a veritable ‘sub-population’ of the city. The little buggers are currently rumoured to be running rampant to the score of over 400, making it literally impossible for us to try and keep track of them, or for visitors to try to find all of them on their own. 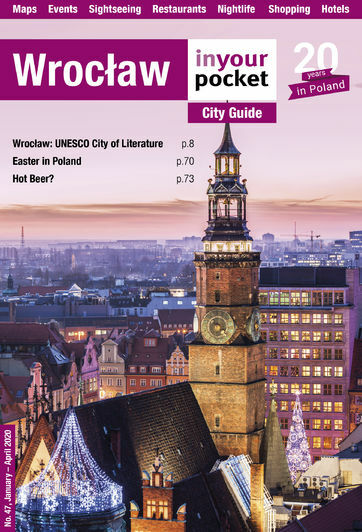 Seeing how many gnomes you can spot while you're in Wrocław, however, is an incredibly fun alternative to traditional sightseeing, and a great way to keep the kids involved while tramping around town. To help you out we've GPSed 25 of our favourite gnomes below, so you can use your smartphone to find them while you're out and about. If that's not enough, you can also pick up a special map from tourist information (Rynek 14) showing where to find 30 of the most centrally located gnomes, and there is even a special, dual-language (Polish and English) website dedicated to Wrocław’s gnomes - www.krasnale.pl – where you can find their history, photos and other information, including downloadable maps of their various locations. Spend an afternoon as a gnome-watcher and see how many of these mischievous miscreants you can spot as you stroll around town. Happy hunting! Pouring over books from Wrocław's adopted library, this little guy is hidden inside the alley of the Ossolineum. An ornery lady gnome wielding a frying pan inside the Społem convenience store. See if you can spot this funny pair near the hippopotamus habitat. Wrocław's 'Keymaster' sits watch across from St. Mary Magdalene's Church. Sigmund (or 'Zygmunt') Freud, here in gnome form with his cigar near the Wrocław University Institute of Pedagogy. Find this little snorer outside the entrance of Hotel Patio. This little guy can be seen doing his laundry on the banks of the Odra between Most Piaskowy and Most Tumski. 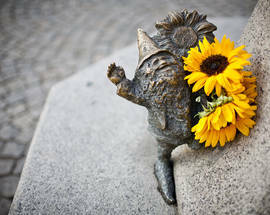 This beloved and much photographed pair were among the first gnomes to appear on the streets of Wrocław. A short walk from the Iglica you'll find this loving gnome swaddling and bottle-feeding an infant little person.